Being inherently of Chinese origin, one might assume that I would have a certain attraction to the paintings of the East. In fact, my upbringing in Western society has actually steered me towards Western European art, leaving me almost ignorant to the understanding of a tradition of art that has become part of my heritage for over a thousand years. Even my annual visits to the Hong Kong Museum of Art or the Chinese section of the British Museum left me puzzled and inadequately equipped to talk about this category of art. A collection of artefacts in a museum can only tell you so much but it takes an exhibition to take you on a journey to really see where these pieces fit in the history of art. Specifically in this case, Western biases are brought to attention as we explore Eastern interpretations of their respective artworks. 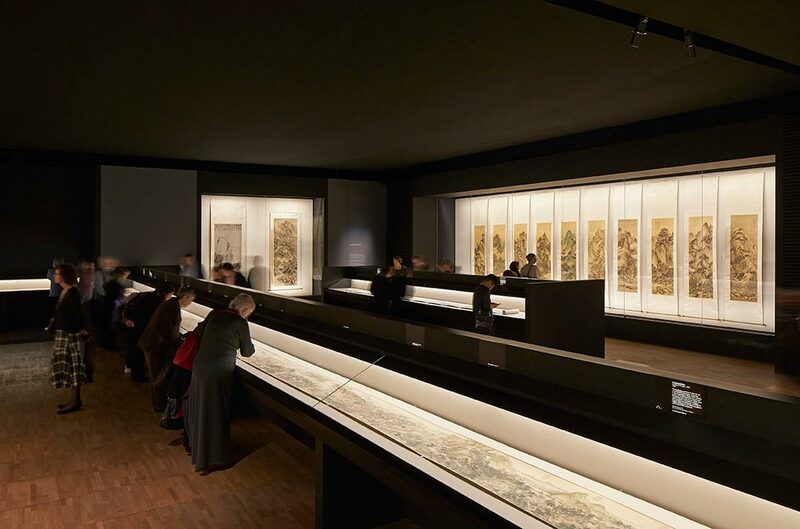 This is exactly what the Victoria & Albert Museum has succeeded in doing for its Masterpieces of Chinese Painting 700-1900 exhibition. 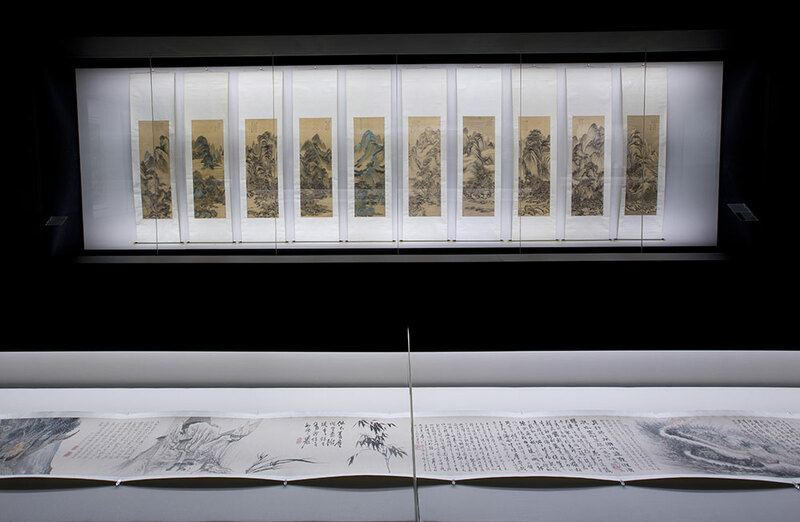 The exhibition is divided into five sections across the 1200 year period, introducing us to various genres of Chinese painting and groups of painters. We see different kinds of styles similar to Western painting but occurring much earlier than we would expect in art historical development. In a sense, parts of Chinese art could be considered avant-garde from a Western perspective. The position of painting in Chinese culture was also on the same level as poetry and philosophy, just like its precedence in the Italian Renaissance. However, many of these paintings were kept out of display, stored as treasured possessions in boxes, with very few audiences. There are two types of scroll paintings: vertical hanging scrolls and horizontal handscrolls. The first period is from 700 to 950 when most Chinese art was devotional and religious. Silk was the predominant material used and these were turned into votive banners displaying intricate images of the Buddhist bodhisattvas such as Ksitigarbha, often known as the Lord of Six Ways, and Guanyin, the bodhisattva of compassion. The natural deterioration of a painting from 729 shows the artist’s change in thought: two faces can be seen on the same figure, one of an old monk and the other of Ksitgarbha. From this we can also see the artist’s understanding of how this bodhisattva came to being, starting off as a Buddhist monk. As a result, literature plays a part in art, a theme that will be explored later. Alongside philosophy, astrology played significantly in Chinese beliefs. Planets and constellations were attributed to specific deities, representing the five elements – Fire, Water, Earth, Metal and Wood – believing that they foretold a person’s destiny. A handscroll called The Five Planets and Twenty-Eight Constellations (700 – c. 800) shows them in human form. The Five Planets and Twenty-Eight Constellations (detail), 700 – c. 800. Image via www.vam.ac.uk. 950-1250 introduces us to the painting of reality and the visible world in the Song Dynasty. It is here when we find the manifestation of landscape (shan-shui) painting as well as the first poetry-to-image translations. Li Gongnian’s Winter Evening Landscape (c. 1120) with its monumental mountains rhythmically composed across a vertical strip of silk form a typical shan-sui painting. Calm and serene they depict the beauty of the natural world, often compared to the heavenly realms, with a particular interest in the movement of light. One of the highlights of this room is the ten-metre long Nine Dragons (1244) by Chen Rong. Symbolising the forces of nature these dragons dance among the clouds, waves and mountains, their intricately painted scales fading into obscurity before re-emerging as snarling mythical creatures. However, despite their ferocity of the dragons, the painting itself remains rather peaceful. Religious subjects were still popular during this period but their focus were on the luohans, the disciples of the historic Buddha. In Zhou Jichang’s Luohans Bestowing Alms on Suffering Human Beings (1184), grace and destitution are contrasted with dramatic effect, emphasising the materialism of earthly living. Zhou Jichang, Luohans Bestowing Alms on Suffering Human Beings, 1184. Image via www.mfa.org. Poetry began to accompany paintings – despite this tradition having originated much earlier in the poetry-painting works of Li Bai and Du Fu in the 8th century – starting off with microcosmic illustrations on everyday handheld fans, proceeding to large scroll paintings and giving rise to the ‘literati’ artists, explored in the period 1250-1400. With the close relationship between poetry and painting, it is not surprising that these literati artists were also scholarly civil servants of the court, usually having passed the civil examinations during their education in the School of Literati. They would have had a relatively high position in the palace court, sometimes even as military advisors, with a relationship to the Emperor similar to that of Alexander the Great and Apelles, popularised by Pliny the Elder. It is also here when we begin to see the emergence of works on paper, opening up new techniques of painting such as the use of ink wash, a characteristic of literati painting. A particularly unique painting on paper is Qiao Zhongchang’s Illustration to the Second Prose Poem on the Red Cliff (1100-25). Painted in the baimiao technique – essentially outlines without any colour or ink washes – it illustrates a poem by Su Shi (also known as Su Dong Po), one of the major personalities of the Song dynasty, securing itself as one of the first narrative scroll paintings in Chinese art. Due to its merging of calligraphy, poetry and painting, it has often been considered as an example of the ‘Three perfections.’ However, not all Chinese art had a straightforward face-value interpretation, especially with the literati who often laced their works with political themes, such as that of freedom in Doves and Pear Blossoms after Rain (1250) by Qian Xuan. Qian Xuan, Doves and Pear Blossoms after Rain, 1250. Image via commons.wikimedia.org. By 1400-1600 we can see a manifestation of varying subjects including commissioned portraiture, genre scenes and allegorical paintings. Images at this time were intended for display during seasonal festivities and occasions, appearing more decorative and catered to the masses. As a result, public image becomes a thing of concern, seen later in the exhibition. All of a sudden, the mountains are bursting with unimaginable gradients of colours in Saying Farewell at Xunyang (c. 1515-52), usually attributed to Qiu Ying, and good fortunes are praised on viewers in the form of symbolic animals such as the phoenix. But the decorative elements aren’t solely painted. On every silk scroll – whether hanging or handscroll – blissful images are embroidered onto its surface, like those on imperial Chinese robes, but much simpler, smaller and subtle in their choice of colour which blends with the silk. Qiu Ying, Saying Farewell at Xunyang (detail), c. 1515-52. Image via www.vam.ac.uk. The last room, 1600-1900 – better known as the Qing Dynasty – branches off into two distinct sections. The first deals with the recognition of two pronounced artistic groups who constitute two rather different opinions within early art criticism: the Traditionalists and the Individualists. The Traditionalists were usually made up of the literati, drawing inspiration from Old Master paintings and early lineages. Wang Jian’s set of 12 Landscapes in the Manner of Old Masters (1669-73) – though only ten are exhibited – is an excellent example to illustrate the philosophy of this group, with their distinctly prominent forms and grand sense of scale. In a similar way to Pablo Picasso, the reinterpreting and reinventing of early works was a way for these artists to explore traditional techniques as well as to pay homage to their predecessors’ ingenuity. Wang Jian, Landscapes in the Manner of Old Masters, 1669-73. Image via www.vam.ac.uk. The Individualists, on the other hand, relied on alternative sources of inspiration, mainly personal experience and the visible world. Fa Ruozhen in his Clouds and Mist in the Mountains (c. 1690) ambiguously blurs the forms of the clouds and the rocks, creating a sense of disorientation which may or may not have been from Ruozhen’s own personal experience in the mountains. One could say he is painting an ‘impression’, an undeveloped vision, a fleeting glance of a momentous view. Flowers on the River (1697) by a 72-year old Bada Shanren, considered one of the greatest Chinese painters of all time, depicts the life cycle of lotus flowers, from their emergence as buds to their death. Known for the autobiographical context of his works, Flowers could be seen as a reflection on the artist’s life as he approaches his death eight years later. The accompanying poem, with its comparison between diamonds and “A single lotus seed that is visible but does not exist [in the picture]”, suggests not only the giving up of pursuing material goods but also of the process of creativity and the wonders it can produce which far exceed the limits of the material world: “Alas! The whole world is within my lotus./Have I transmuted the ingredients of the Elixir?” Shanren’s painting transcends reality in its visualisation, and so will he when he rests in the Heavens, peacefully and joyously, singing a ballad about his oneness with “the splashes of spring water and the sprays of flowers”. Finally, we see the influence of the West with the acceptance of the Jesuit missionaries, notably Giuseppe Castiglione, allowing for interaction between European and Chinese painters. We begin to see attempts at chiaroscuro – contrasts between light and dark – in Chinese portraits, bringing the flatness of traditional subjects into a three-dimensional space. Fan Qi became one of the first artists to paint a true horizon, seen in Yangzi Riverscape (1660-70), breaking the ambiguous separation of Heaven and Earth traditionally used in Chinese landscapes. The prime highlight of this very last room – though its status really puts it at the forefront of the whole exhibition – is Xu Yang’s Prosperous Suzhou (1759), loaned directly from the Liaoning Provincial Museum Collection. At over 12 metres wide, it was commissioned by the Qianlong Emperor in 1751, taking three years to complete in the imperial workshop within the Forbidden City, Beijing. It depicts the flourishing urban life of 18th century Suzhou, a city that was part of the Emperor’s reign, incorporating around 4800 human figures and 2000 architectural structures. This also happened to be the hometown of the artist so it serves as an incredible document of urban daily life in the city through the eyes of a local, with its village operas, civil examinations, and fishermen at sea, potters beside their creations, workshops, and even guards transporting gold into a safehouse, signifying profit. The commission began when the Emperor was on his southern inspection tour and he had the chance to see Xu Yang’s work, later summoning him to the capital to serve as court artist, where he quickly rose up in ranks and gained much respect. At first glance, one can instantly attribute its composition to “China’s Mona Lisa”, Zhang Zeduan’s Along the River during the Qingming Festival (1085-1145) in the Palace Museum, Beijing, which stands at only five metres wide. Sadly, the latter was not included in the exhibition – it has only ever been temporarily moved and exhibited on two occasions, both to commemorate diplomatic relations with Hong Kong and Japan. Prosperous Suzhou combines Western linear perspective with Chinese multiple vanishing points, creating a panorama that is visually convincing and exceptionally detailed, down to each individual leaf and roof tile. This painting served as a historical record of the Qianlong Emperor’s achievements during his reign, never intended for public display. Public image undoubtedly played a part in the commission’s conception, but it is a piece of propaganda not for the masses, but for self-admiration and historical documentation. A truly marvellous work of art. For the Western viewer, this is a fascinating introduction to a branch of art history that is often shadowed by the more prominent writings on Western art. Because we are so accustomed to seeing art through the lens of Western culture, a bias is unconsciously imposed on our interpretation of non-Western art. This exhibition, curated by Hongxing Zhang, allows us to see Chinese art with the eyes of an individual whose culture has very much been influenced by the artistic developments of these truly outstanding generations of artists. 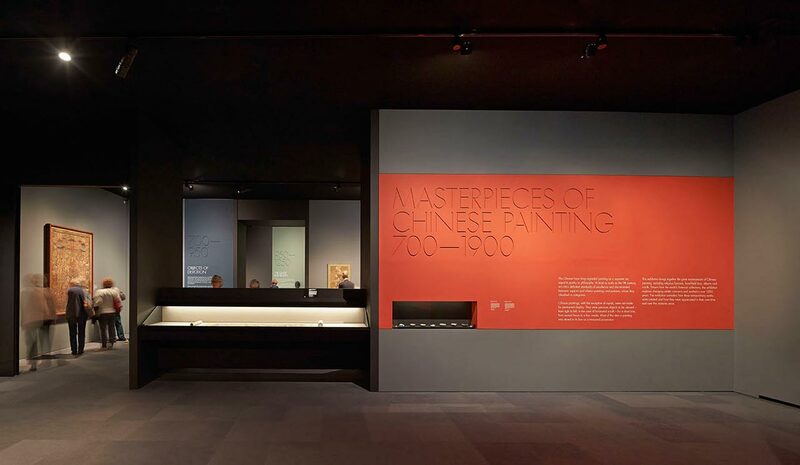 Beautifully curated and designed with the help of Stanton Williams Architects, this is a must-see exhibition that will really open your eyes to some of Chinese art’s greatest treasures. Masterpieces of Chinese Painting 700-1900 runs until 12th January 2014 at the Victoria & Albert Museum, London, www.vam.ac.uk.